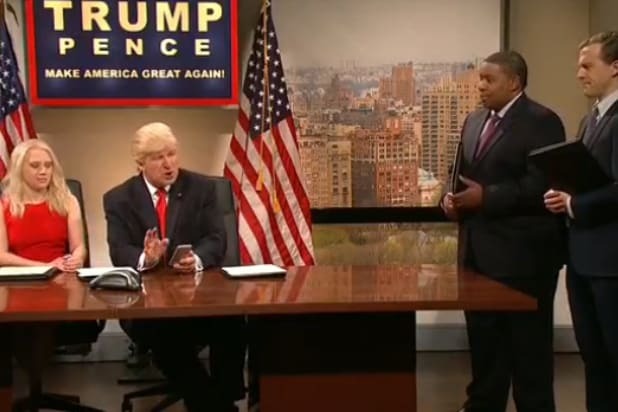 President-elect Donald Trump has been expressing his displeasure over Alec Baldwin’s impersonation of him on “Saturday Night Live” throughout the current season and, apparently, this week he even decided to try watching “SNL” as it aired live. The experiment went predictably bad. Halfway through the episode, Trump once again took to Twitter to air his grievances against the show. He called it “unwatchable,” “totally biased” and “not funny,” before taking particular exception with Baldwin’s performance. There is some irony in Trump complaining on Twitter about Baldwin’s appearance on “SNL” this week in particular. The cold open was all about Trump’s propensity to retweet people that the President-elect probably shouldn’t be retweeting, like teenagers and people who have “liberalism is a mental illness” in their Twitter bios. Kellyanne Conway, who is also regularly impersonated (albeit far more sympathetically) on “SNL” by Kate McKinnon, recently asked CNN’s Chris Cuomo why anybody cares that Trump complains about “SNL” on Twitter all the time. “You’re assigning malice, you’re assigning wrongdoing to him, where it doesn’t exist,” Conway said.